He looked better dead than alive. Can’t say that about many people. Karen E. Olson’s crime fiction series featuring crime reporter Annie Seymour always leaves me craving pizza. I am sure it has something to do with all the talk of food and the great restaurants in Annie’s New Haven. Annie doesn’t actually get her pie in the latest novel, Shot Girl, but the mere mention of it is enough to make me want a slice. Annie Seymour did not want to attend the bachelorette party of a colleague nor did she want to run into her ex-husband, whom she had not seen in 15 years, at the Rouge Lounge. She most definitely did not want to have suspicion fall on her when he ends up dead on the sidewalk outside of the club. The .22 caliber gun in her car and casings around the body point in her direction, however. Temporarily placed on the social services desk, writing articles about community gardens and quilting bees until the investigation into her ex-husband’s murder is sorted out, Annie couldn’t be more miserable. Crime reporting is where her heart is, and she cannot leave it behind even if it means carrying out her investigation on her own time. Annie is determined to find out just what her ex-husband was involved in before his death and what secrets everyone is keeping from her. Nothing is quite what it seems, and the closer Annie comes to the truth, the more danger she ends up in. Annie Seymour is as brazen and persistent as ever and still going against the advice of both her private investigator boyfriend, Vincent DeLucia, and her former lover, homicide Detective Tom Behr. Author Karen E. Olson takes readers into Annie’s past as Annie struggles to come to terms with her past as well as the events unfolding in the present. She cannot help but look at where she has ended up in life as compared to what she had wanted when her life was still very much ahead of her. Her life has not quite worked out the way she had anticipated, but then, life seldom does. The reader gets a glimpse at why Annie is so cynical and untrusting. It is no surprise that Shot Girl is filled with a colorful cast of characters, just as the previous books have been. Annie always manages to attract the most interesting of people, whether it be a young hoodlum, a reverend with a shady past, a college professor with a penchant for his female students, or a male stripper whose stage name is Jack Hammer. The author has been known to mix things up style wise, taking a different approach with each of the four books in the series. In Shot Girl, the main character, Annie, is an unreliable narrator. Annie is too personally involved and keeps relevant information close to her vest, not only from the authorities and her boyfriend, but also from the readers. This was an effective technique in keeping me guessing as to what would happen next. Shot Girl was definitely a compelling read and impossible to put down. I devoured it in a matter of hours. As much as I have grown to love Annie, I am looking forward to seeing what else Karen E. Olson has up her sleeve with her new series, the first of which is due out next year. Be sure and stop in tomorrow to read Karen E. Olson's guest post. 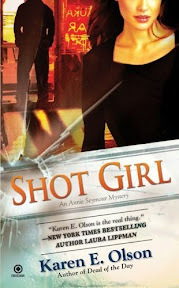 Many thanks to author Karen E. Olson for giving me a chance to read and review Shot Girl! This is the second blog today that I have read about this author, I think it is a sign to check her out! Thanks for the review. Thanks for a fabulous review, Wendy! Of course I'm going to get this book (and Karen's upcoming releases as well!). Alice - I enjoyed your review too, Alice! I am sad that we won't be able to spend any more time with Annie (except in rereads). I'm sure the new series will be just as good though. Kelly - It is an enjoyable series. I discovered it last year and haven't looked back since. Jen - Oh! Do read it. I'd love to know what you think. Melody - Thank you! I think you'll enjoy Karen's guest post! John - It is a good one! I hope others who like this type of book will give the series a try. This series is getting some good press! I'm adding it to my list. Thanks! OK, you've captured my interest. I think I need to go look up and read book number one! You pointed out some great parts about this book. I was actually surprised by how much I distrusted Annie because of all the little details she was not revealing as the investigation went along. I really liked that though - again, just shows that this series is really getting better! Jenclair - I really enjoy the series. I hope you will too if you decide to give it a try! Denise - Oh goody! I hope you enjoy it even if just half as much as I do, Denise. Iliana - I found myself distrusting Annie too, but as you suggested, it worked well for the book. This book sounds very good. It was nice to see the post by the author also. Between the two of you, I think you have me convinced to pick up this book. 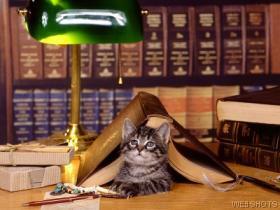 Book Lover Lisa - I hope you will give the series a try! It's a good one! I can send you the HTML code for the rotating blog role if you would like. I got it from fellow blogger, Melody.